The information generated by billions of connected devices requires an enormous amount of real-time processing and storage. Some connected cars now upload 25GB of data per hour. A connected airplane can generate a petabyte a flight. But to realize the benefits of IoT, you need to decide which use cases to tackle first. You also need to choose the right architecture and set of technologies that can process large data streams, identify important events and react in real-time. Many companies who have succeeded with IoT have solved their challenges around speed, scalability and real-time analytics with in-memory computing. Across these deployments some common architectural patterns have emerged. 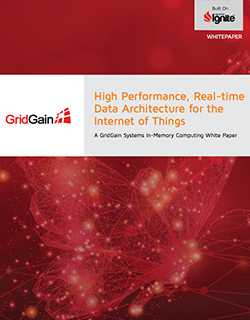 This whitepaper explains some of the most common use cases and challenges; the common technology components, including in-memory computing technologies; and how they fit into an IoT architecture. It also explains how Apache Ignite and GridGain are used for IoT.